Collaborative journalism is now being practised on a scale that constitutes a revolution in the media, found a report published today (29 September) by the Center for Cooperative Media at Montclair State University. Based on interviews with key figures involved in these type of projects, as well as industry events and literature reviews, the paper outlines six types of editorial partnerships between newsrooms, and the benefits and challenges of each one. It also provides examples and best practices from 44 ongoing collaborations involving more than 500 newsrooms in the US and Europe. Sarah Stonbely, research director at the Center for Cooperative Media and the report's principal investigator, identified two main elements according to which editorial partnerships are organised: length of time, and the level of involvement shown by the participants. The latter ranges from creating content separately and distributing it, to working together on reporting and, lastly, sharing resources at an organisational level. The advantages of working together include gaining access to skills, workflows or expertise, reaching more people, and delivering a better project than it would have been possible to achieve on one's own. On the other hand, tensions to take into account range from different newsroom cultures to resources spent on training, and convincing the organisation to get on board with the collaborative approach. Projects where organisations work independently on producing content, with or without set guidelines, and then present it on one or multiple websites. Suitable for first-time collaborators, small news outlets looking to reach a bigger or more diverse audience, and for topics that tap into a community of interest, it allows organisations to "dodge the problem of competing organisational cultures and priorities". This type of initiatives, which include ProPublica's Electionland, require newsrooms to work together and coordinate more, sometimes investing more resources, which can also lead to tensions around prioritisation. They suit investigative and accountability stories, time-sensitive projects, and organisations looking to gain access to certain skills. The paper points to Panama Papers as the best example in this category, in which participants share data and/or other resources at organisational level, maintaing regular contact and coordination throughout the project. Newsrooms with previous experience in working together as well as those doing reporting involving large amounts of data should consider this approach. This model focuses on ongoing arrangements to create content separately and distribute it, used to cover topics where varied expertise is needed. It is also employed by smaller and hyperlocal outlets that require more content than they are able to produce by themselves. However, there is a need for ensuring that both parties benefit from a collaboration of this kind, to avoid a situation where cutting costs and "increasing the bottom line" are made to seem like partnerships, Stonbely pointed out in the report. "What distinguishes the two is the intention," she told Journalism.co.uk. "If that's to cut costs and repurpose content by just changing the headline, that's not the type of sharing we are talking about here. It's about coming together to truly create content that is better than they could've done on their own." 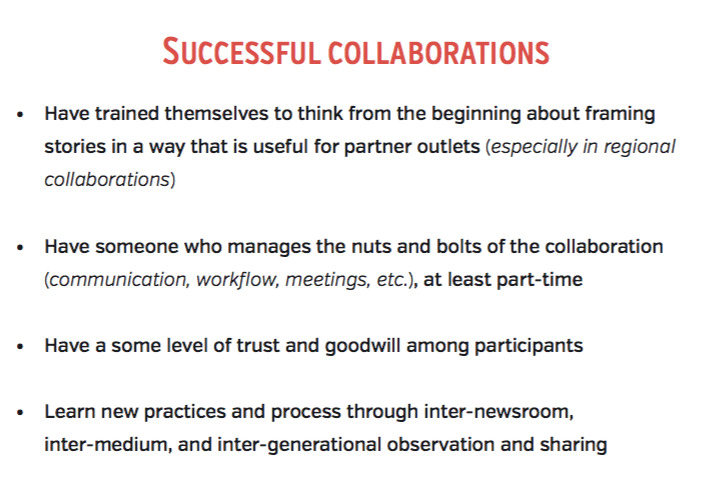 Newsrooms working on this type of partnerships work more closely together, holding regular meetings and calls, usually managed by a person dedicated to collaborative projects. In some instances, they also have access to "a mutually beneficial back-office arrangement, such as an ad-sharing network". This approach works for outlets located in the same region, targeting similar audiences; organisations that seek additional resources but can also offer something in return; and projects that can afford a dedicated collaboration person. Having a project manager at least part-time, who can take charge of editing responsibilities and set up calls between partners, was "one of the main variables for success", Stonbely said. These are the initiatives where collaboration is part of an organisation's DNA, which the report says is "not yet very common" but which has the potential to "address the challenges of the local media landscape". These partnerships share editorial resources but also elements such as accounting, funding and engineering. The Center for Cooperative Media is planning to look at non-newsroom collaborations next, such as those involving technology companies and foundations. "The resource scarcity among newsrooms, especially local, is going to drive more collaboration. There was also a lot of cultural resistance [to working together] among larger or legacy news organisations, and I see a lot of that eroding too," Stonbely said. "At the Center for Cooperative Media we think [collaboration] will be one of the ways that news organisatios of all sizes find sustainability in this new digital age where we're still trying to figure out business models." 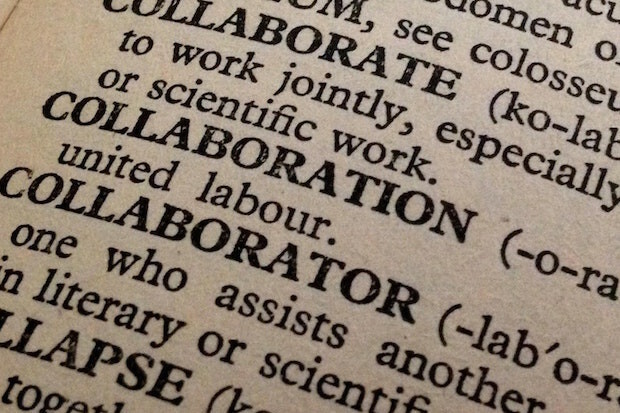 Collaboration in the newsroom is a topic we will be discussing at our upcoming newsrewired event on 22 November. Find out more about the agenda.